What's the easiest solution for odour problems at pump stations? OdourPro's FiltaVent™ range of compact, ground mounted, passive vent filters are perfect for pump stations. These Australian designed and manufactured filters provide a quick, cost-effective solution to sewer gas odours. The FiltaVent™ filters come in a range of sizes to suit various applications such as small pumps stations, air relief valves and sewer manholes. They can also be used domestically to treat on-site wastewater systems around the home. The filters are easily installed and provide instantaneous results with the absorption of toxic odours. These filters are an excellent option to replace old corroded and unsightly vent stacks. So in addition to removing the odours, FiltaVent™ filters improve aesthetics for the local community and reduce the impact of the infrastructure on the local environment. Are there any tools for detecting levels of rotten egg (H₂S) odours? Odour Pro provides a comprehensive odour logging service for pump stations & manholes. We analyse and evaluate data and report on our findings. Key parameters we monitor include H₂S gas and temperature data logging using industry standard testing procedures. We can provide a full analytics and report service or a simple monitor hire for self-service data logging. What industries does OdourPro specialise in? OdourPro will find a solution for your odour problem by treating it at the source rather than simply covering it up. We offer customised products to suit specific sites, specialising in treating odours at wastewater, solid waste and manufacturing facilities. Why would we dose with ferrous chloride, aren't there less dangerous and more effective treatments available? When handled and installed appropriately, ferrous chloride dosing units are extremely useful in abating hydrogen sulphide levels, which are the main gas emissions produced by sewers. Our dosing unit products are designed to adhere to the latest dangerous goods and corrosive substance regulations. Our units use the latest automation technologies for minimal maintenance time and cost. How do I find the most high-performance and cost-effective odour solution for a wastewater pump station? OdourPro takes a holistic network-wide approach to odour control. This may involve necessary operational changes to the upstream network, chemical dosing, gas extraction or a combination of all of these interventions. OdourPro has expertise in the whole gamut of odour control technologies to ensure optimal odour reduction. How do I make sure I am getting the best possible cost/benefit outcome from my odour control system? OdourPro has the specialty knowledge to undertake a full assessment of your odour control system. We offer a desktop study of your network, gas monitoring, wastewater sampling and analysis, as well as refurbishment and optimisation of your odour control facilities. 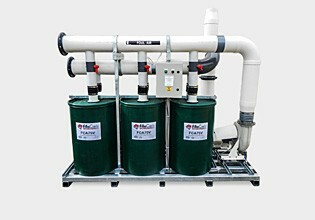 How do I choose the right sized carbon filter or biofilter for a sewer pump station? The first consideration is to determine what extraction rate is required to achieve at least six air changes per hour. Another important parameter is the average and peak concentrations of hydrogen sulphide and other VOCs generated in the wet well. With that information, OdourPro can determine which standard unit is applicable or if a custom design is required. Were you previously called Odour Control Systems? Yes, we were. Now we are known as OdourPro and are part of the Bulbeck Group. Do you manage odours in hotels, clubs or retirement villages? No, we don’t service commercial sites. We design our products for industrial applications. Do you sell activated carbon units? Yes, we have a complete range of carbon-based solutions from small passive vent style units through to high capacity automated models. What’s the best way to stop odours crossing the boundary of our composting facility? The best way of treating site boundary odours is to use a perimeter vapour system attached to your outer fence. It would only be necessary to do this on the perimeter that is causing the odour complaints. Are these perimeter systems expensive to maintain? Our VapourGard® systems are an extremely low-cost odour control option as they can be configured only to run when the wind is in the offending direction. It also has an integrated 24/7 timer so it can be programmed to run at specific times of the day and week. Maintenance is virtually nil with just a simple solution level check requirement.